This is a template for an I Am poem. 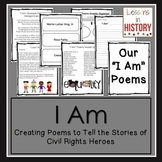 This is a great writing, self reflection activity for students any time of the year. All purchases intended for single classroom use only. Thanks and Happy Teaching! 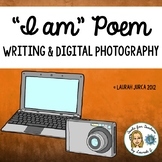 An I AM poem with a TWIST! Prompts have been added to the line starters to encourage full statements using descriptive details and strong adjectives. For example, "I am __ because__ (strong adjective describing how you feel about your topic and a specific reason). Includes lines for the 5 senses. 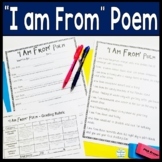 I Am poem form - great for the beginning of the year. 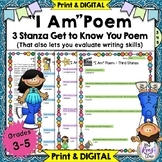 Fill in the blank activity results in a great poem once complete. 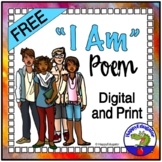 This set includes 24 poems and instructions for using them in your classroom.These poems are a good way for students to practice reading skills, learn sight words, build critical thinking, and work together to solve the weekly riddle. 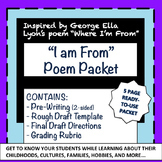 "I am From" Poem Packet: Back-to-School!